Acetaldehyde is a “Green Apple” off flavor that is common in some beers. It is one of the sixteen listed off flavors on the BJCP beer judge score sheet, and can ruin an otherwise enjoyable beer. It can also sometimes have an aroma and flavor like fresh cut pumpkins or dry cider but is distinct from the pear flavors more common in beers with excessive esters. The compound acetaldehyde (C2H4O), also called ethonal, is a common compound that comes in everything from ripe fruit to coffee. It is also an intermediate compound produced by yeast during fermentation. As fermentation progresses to completion, all of the acetaldehyde is normally converted to ethanol (note different spelling from ethonal) which is the alcohol in beer. However if fermentation fails to complete for any reason, we can end up with acetaldehyde in the finished beer. This can happen for a variety of reasons related to yeast health. Some of the common causes for an incomplete fermentation include not pitching enough yeast up front, yeast that starts out in poor health, failing to aerate your wort which will impede healthy yeast growth and also halting your fermentation too soon. 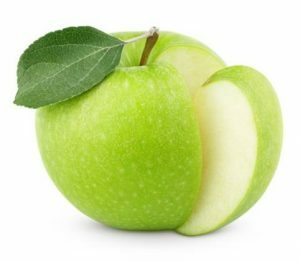 You can also get the “green apple” flavor if you have poor temperature control during fermentation which can drive excessive acetaldehyde production or prematurely stop fermentation. Finally you can get it by pitching finings too soon – which can force the yeast to flocculate out before fermentation is complete. A secondary, though less common cause is exposing the finished beer to oxygen. Alcohol (ethanol) can produce acetaldehyde when exposed to air, though oxygen also tends to produce other off-flavors as well. Allow your fermentation to fully complete before bottling or adding finings. Don’t expose your beer to additional oxygen once fermentation has started. That’s a quick tutorial on eliminating the green apple flavor from your beer. Please check out my other articles on off flavors. Thanks for joining me on the BeerSmith Home Brewing Blog. Be sure to sign up for my newsletter or my podcast (also on itunes…and youtube…and streaming radio station) for more great tips on homebrewing. Also check out the How to Brew Video series I shot with John Palmer if you want to learn more about all grain brewing. nice post i want how to make home made wine without machine please help me.